There is not a single possible way you can be looking at the picture of my latest Willy Wonka Cake and be grumpy, so Happy Monday to all of you! I do apologize that you can’t reach through the screen and take a bite, or sneak a candy though, because this is one fun, happy cake! It’s neon and it’s here to stay, baby! This latest creation came about when I found out that Mike’s friend at work, Phil, was turning a year older. We’ve witnessed the Olympic Torch come through town (read it now, my funniest post EVER on this site) with him and his family, his lovely talented wife has painted the kids faces at my son’s birthday party and he and my husband generally get up to anything but work, at work. So when we found out the day, I set about making a cake that sums his delightful character up. Welcome to the Willy Wonka cake, for the big kid who hasn’t grown up yet. This was a seriously F-U-N cake to make, a good time, a hoot and a holler creating something so bright and colorful. Have I mentioned how easy and forgiving this cake is? Using the KitKat’s around the cake is something I saw a couple years ago on the interwebs and promptly tucked it into the back of my mind on those few grey cells that comprise the Make It Sometime List in my brain. And it literally came to the forefront in a couple seconds when I was brainstorming of what to make for Phil. The cakes that did the rounds a few years back had M&M’s in them, which are also a great choice. And it was what I was initially going to do. But while walking in the grocery store my eyes came to a halt on huge Willy Wonka Candy display. And the cake was born. First you need to bake up my favorite chocolate cake recipe, in two 9 or 10 inch pans. I usually pre-bake the cake and freeze it, much easier to work with, especially when you have to trim it! When you have the two layers baked up, make a batch of my Chocolate Buttercream Icing. The one batch is enough to frost the cake. Put a small middle layer of icing between the cakes and put one on top of the other. 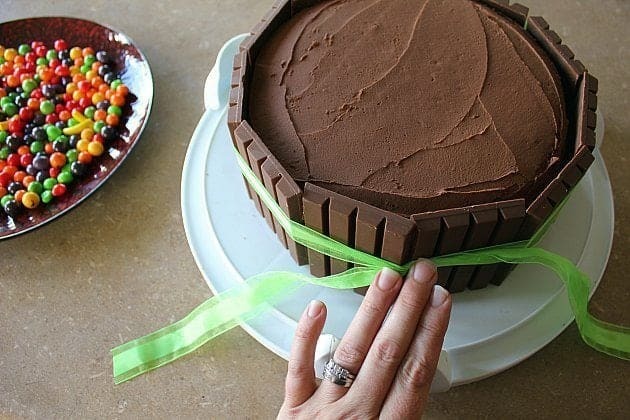 You DO need to take a knife and carve the sides of this cake to make sure that they are fairly even, otherwise the Kitkats won’t do a good job of standing straight along the edges. When that is done, frost the sides and top. It doesn’t have to be pretty since we are covering up all the surfaces. 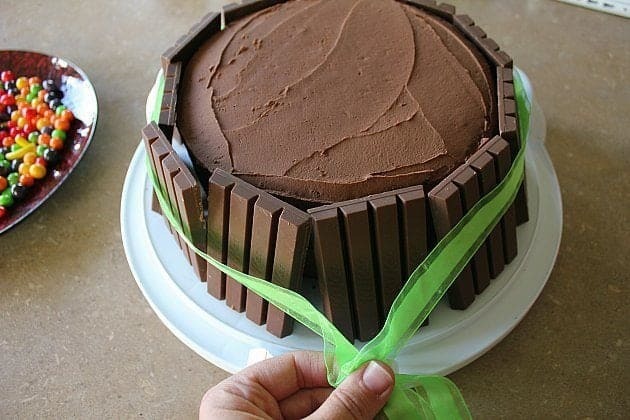 Take your 11 or 12 Kitkats, depending on the size of your cake and line them up on the outside of the cake like this. A little trick here is to freeze the Kitkats, because if you don’t, you leave fingerprints on the chocolate outside. In order to avoid this, freeze them! It won’t effect the taste at all. Ready your Wonka Candy! I had two different types of Gobstoppers and Runts. Loosely wrap your ribbon around the KitKat…. And Pull! Pull! Pull! Until the Kitkat’s stand up straight and are tight against the cake. You can exert quite the pressure at this point without breaking them if you have a nice wide ribbon. Tie it up tightly, helping push the KitKat’s into the icing to stick a bit better. 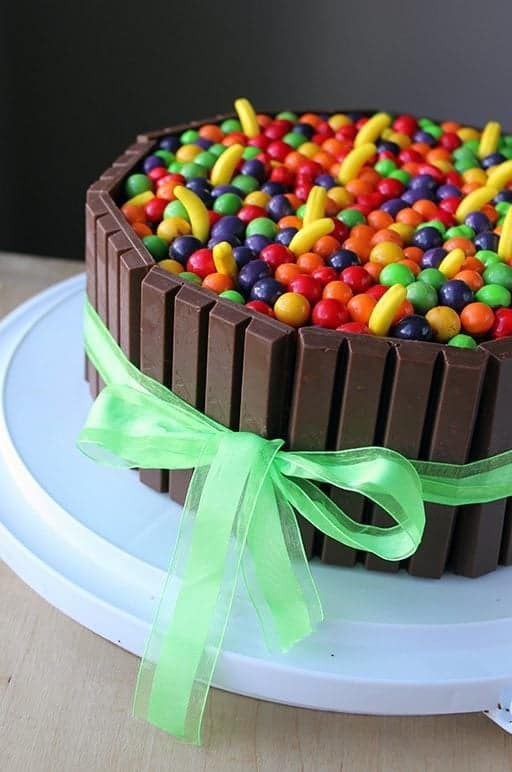 Start filling up your cake top, which is the best part of this whole cake, what could be more fun than loading up a cake with candy? I played around with the candy, finally deciding that the bananas sticking up gave the top a nicer texture and more levels for eye candy.On another note, you can freeze the cake, then top it with candy, then return it to the freezer, which allows you to make it early but not have the candy get squishy from being on the cake too long. I did it overnight and it defrosted perfectly the next day, with a crunchy candy topping. Have fun with this one folks, but keep the secret of how easy it is to make between us friends, deal? 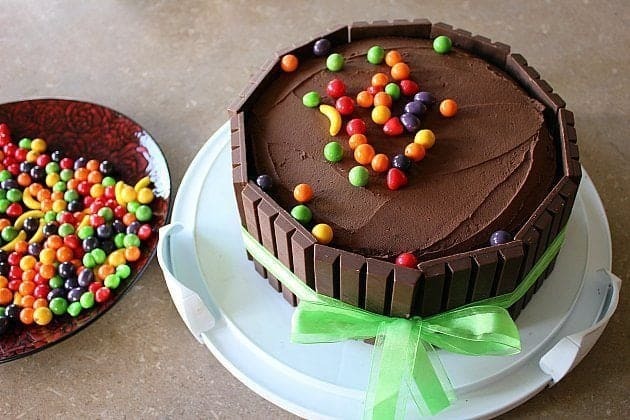 How to assemble a Willy Wonka Cake with a rich, sweet, dark, moist, best chocolate cake and Willy Wonka Runts candy and candy bars. Kick the tires and light the fires to 300 degrees. Get the chocolate and chop it up. Melt the chopped up chocolate in the hot coffee until it is completely dissolved and set aside. Beat your eggs for 2-3 minutes, until they are thick and lemon colored. Time to add the oil, buttermilk and vanilla. Once those are in, add the coffee/chocolate mixture slowly. Then it's time for the dry ingredients, dump them in and mix at a moderate speed until they are combined completely. Grease and parchment line your cake pan. Bake at 300 degrees until done. So excited to make this for my son’s 7th birthday this weekend! Does it matter what kind of roast for the coffee? Nope, any non-flavoured coffee will do! I tried this recipe several times already it turned out great, thanks…everyone loved it. Im thinking of using the basic chocolate recipe for the Willy Wonka to create a red velvet, will this work out if I add red food colouring to it? The slashes can be confusing, those are all one quarter, , one and a half cups, etc. So coffee is 1 and a half cups! hi! i wanted to make this for my classes end of the year party. how long do you bake the cake and will the coffee make the cake bitter? 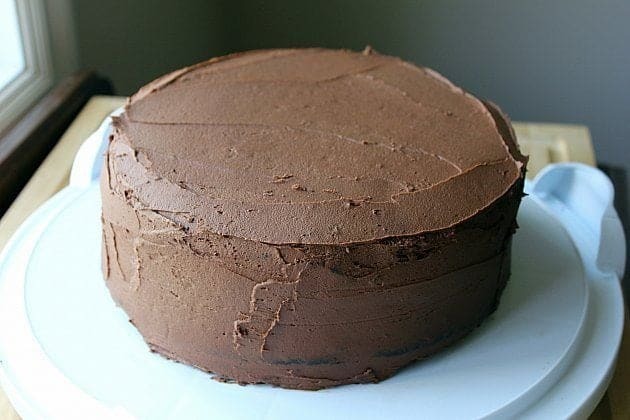 I have made this chocolate cake recipe a handful of times. It is absolutely the best chocolate cake recipe, hands down. I will never bother with another recipe again, because this one can’t be beat. The chocolate icing is to die for as well. Thank you so much for sharing. I do find the cake a bit tricky to cook properly…sometimes successful and sometimes it dropped on me. But even though it might have dropped, the taste was just as good. Now, I’m planning to try cupcakes with this recipe. I’m wondering if I should keep the temperature at 300 degrees or raise it slightly? I would raise the temperature, give it a try! I’ve raised it before to 350 and it’s worked out! Hi. I love this idea. I made one b4 but was from the box and bought frosting so I’m looking forward to making all this from scatch now my question is what kind of coffee can u use or does it really matter? Thanks. 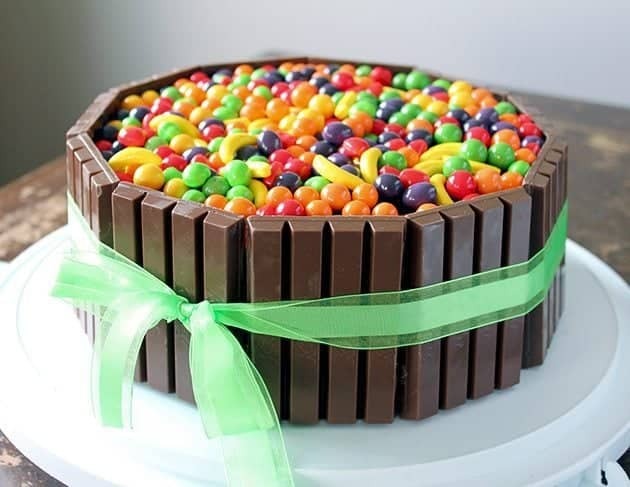 Hello, please I want to make a similar cake for a number 3 and 0 pans(8 by 12inches each) how many kitkats Will I need and how many grams of candy will I need? 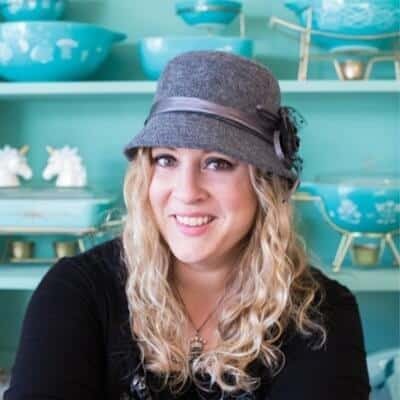 Hi there… Love your website! I’m going to attempt to make the Willy Wonka cake for my son’s 7th birthday next week 🙂 How long approximately does the cake take to bake? ?… I’m an inexperienced baker!! Canberra7 Check the cake at 30 minutes, a knife inserted in the center should come out clean and the top should spring back when pressed on. Hi there. The cake was a big hit at my son’s birthday yesterday! The kids loved it & there were lots of compliments from the adults who had a piece….Thank you for the great idea & recipe! Just think of the sugar rush for the kids. They will be hopping until their next birthday. Hi, I am in a remote area in Australia and as such, there is only so much I am able to buy up here. I am about to do a 160km round trip tomorrow as my sons 6th birthday party is Sunday and we need to get everything tomorrow. Does your cake recipe make enough fo the 2 cakes that are iced together? OutbackMum Yes, it’s a very large cake batter recipe! Good luck, I’m sure he’ll love it! thekitchenmagpie OutbackMum I would like to thank you for several reasons. Firstly, you actually replied to my question and I was able to get everything i needed. I didn’t think you would as this recipe was posted a couple of years ago. Secondly, I made the cake and chocolate butter cream icing (sorry – frosting) exact to recipe and they were perfect. I had to “Australianise” it as I could not get Wiily Wonka candy at short notice but subsituted M’nM’s and Freckles to top the cake (Kit Kats are everywhere). 13 6yr olds loved it and 12 adults did too (only as we were serving cake at party pick up time). The only issue was it was 41 degrees C here and I think that converts to about 105 degrees F so slight melting when cutting cake. Thirdly, I have since looked at more of your recipes and I think I will be doing a lot more baking. And, last but not least, I had to pass your recipe, website, blog on to 8 other parents today and they are excited as I am. Thankyou so much for what you do. I’m so glad it worked out for you! I do try to answer all the questions I get on here because I know that everyone is just looking for honest help! I only wish it was 41 C here…I’ll trade you for my -10 and snow! Thanks so much for the lovely words and passing on my site, I always appreciate it! How long do you bake the cake for at 300 degrees?? Would you use a dark colored pan or light? Thanks!! My son loves WIlly Wonka and Kit Kat…he’s going to love this cake for his 7th birthday!! your the best. awesome image. save time. where did you buy willy lollied? My niece is the lead in the willy wonka play…I can’t wait to make this for her. I must do this someday. That is one cool idea…..love it! This is awesome! 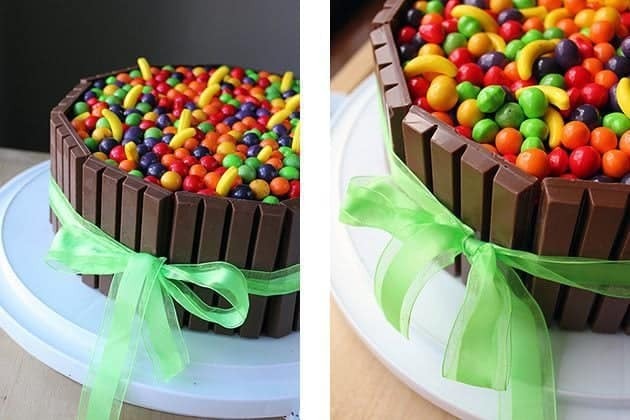 I know just the person to make this for, a real candy lover. The guy I made it for must be close to 40 😉 It’s such a fun cake and easy as heck to make! It’s soo easy to make Kendra! Send me pics too and hug the birthday boy from us! I super love this cake!!!!! Aw thanks! It’s such a fun cake to make as well. Easy and forgiving of mistakes. Love the look of this cake!! My son will love this for his birthday. 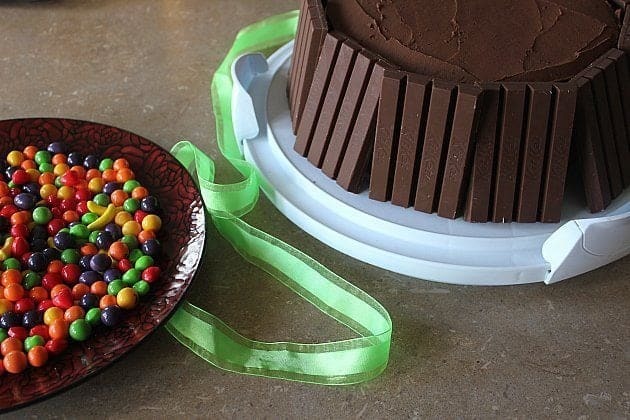 When you cut the cake with the candies fall off the cake or will they stick to the icing. I am worried that once you start cutting the cake it will become a big mess. Thanks for sharing such a cool recipe like this!! 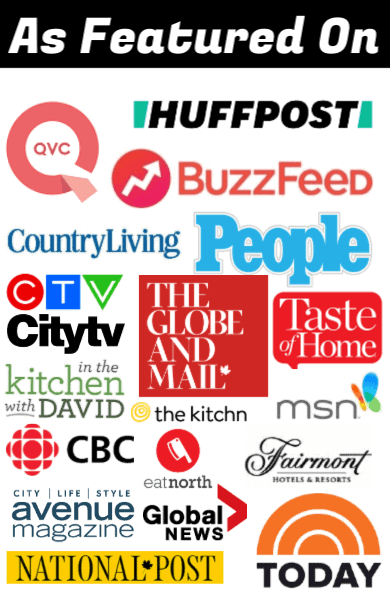 My wife loves your blog and recipe. That is the COOLEST CAKE EVER!